Paris is a city that embodies its history. Century old monuments stare down at snarling traffic; historic bridges span the Seine connecting the left and right banks; everything happened either before or after the French Revolution in 1789. It’s what I love about Paris. Time seems to stand still in many areas of the city. The small groups that gather along the Seine in the shadow of Notre Dame to enjoy the cool evening breeze are one example. The grand cathedral has been a gathering place for more than 850 years. The enormous clocks that adorn the top of the Orsay Museum capture this idea perfectly. Roman numerals are used for each position on the face, and the center of the clocks are clear. Look closely at these people – can you tell if they are young or old? Teens or adults? The silhouette of each person reminds me that a moment in time can be captured with a click, but time continues to move forward. We can’t stop the flow, we can only grow and learn from the experience. Look at this photograph again. Can you see through the clear glass to what lies beyond? It’s the Ferris Wheel that operates in the Tuileries Gardens, just outside the Louvre. It’s another example of how Paris adds a bow on top of centuries of history. And to think that we see it through 19th Century glass that has stood the test of time (as well as marking it)! Ironic, don’t you think? We woke up to sunshine…lots of sunshine. The cooler temperatures that we enjoyed all week had given way to summer – 80 degrees +. Suddenly, everyone was wearing skirts, shorts and maxi skirts with sandals. No more tights or coats! I took the opportunity to see one of my “to-do” list items while she stayed in bed. 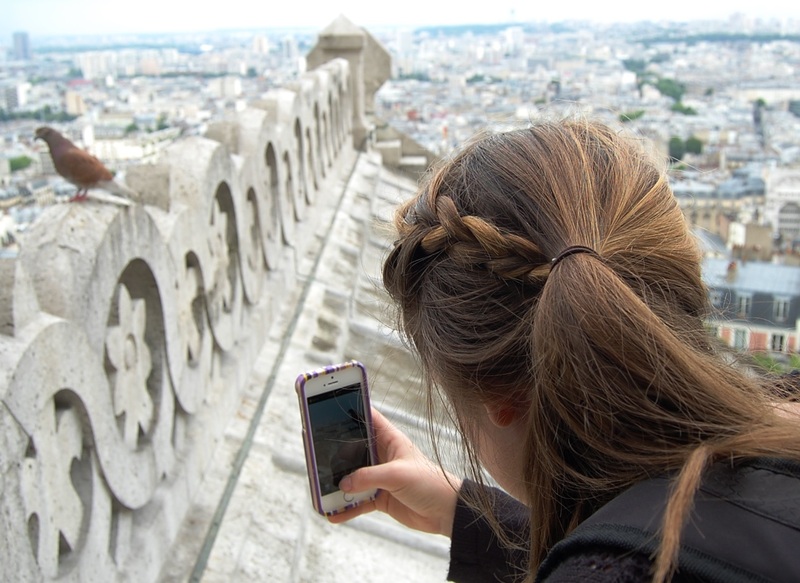 To climb to the top of Notre Dame, you have to get there an hour early and wait. I stopped at a boulangerie and brought several croissants and an espresso that I enjoyed while waiting in line. The great thing about traveling is the random strangers you meet. The young man behind me was very friendly and we exchanged Paris stories. I was able to tell him about the Musee DÓrsay 5th floor secret (see my previous blog post) and the backstreet tour by electric bicycles. He kept me entertained with his travel stories and the time passed quickly. After we bought our tickets and enjoyed the gift store, it was time to begin the climb. 300 steps inside a small, curved staircase made of stone. Small windows kept pace as we trudged up…and up…I started singing the “Happy” song just to pass the time! When we emerged on the upper landing and walked out the narrow door, there was sweet Paris, laid out at our feet. The Eiffel Tower kept watch to the left, while the Seine flowed through as the liquid heart of Paris. Sacre Coeur stood proudly to the right, set on a hilltop and majestic even from this distance. Suddenly, a hundred small voices made us look down. A tourist boat had just passed under the bridge next to Notre Dame. The children all had their hands in the air and were yelling loudly, to hear the echo of their voices off the ancient stone bridge. Everyone who stood on that parapet looked down and laughed. We waived gaily but we were too small for them to see us. 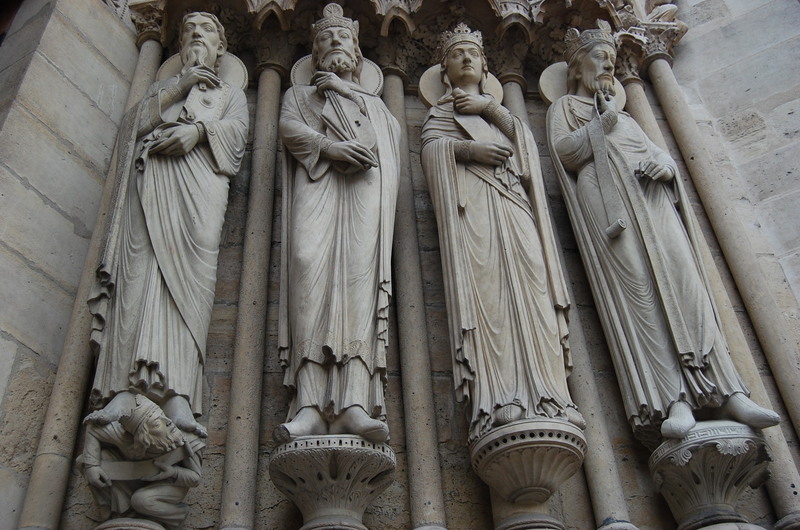 The Notre Dame gargoyles are famous for their fanciful expressions and medieval ferocity. I captured many photos of different gargoyles, looking down on their city. But I discovered a little known fact about several of the statutes that I never read about in a guide-book. There is a statute of two most unlikely subjects tucked away in a corner of the roof that few people notice. (To find out what it is, keep reading). We enjoyed the view of Paris and could see many details. Taking other people’s pictures became my job, as one group after another passed me their camera or phone. We finally started walking toward the other side, and discovered an open door with another staircase. Taking it up brought us to the top of the tower, and another spectacular view. I missed a small step coming out of the doorway, and the young Frenchman who minded that part of the Tower helped me. We started talking and he explained that he was born and raised in Paris. He was now a student at the Sorbonne but did this job in the summer to make some extra money. He agreed with me that he has the best view of the entire city! I wish I had asked for his name, because I will always remember his kindness and friendly demeanor (who said the French were always nasty?). This young man proved that general statement to be utterly false. I could have stayed at the top of Notre Dame forever, but the next small group of tourists were waiting on us to leave. They have to time the groups, because the area where you walk and stand is so small. I thanked my new French friend for his kindness and he thanked me to letting him practice his English! My walk back to the apartment was leisurely, because I knew we had to leave this wonderful city in less than 24 hours. The rest of the day we went shopping. 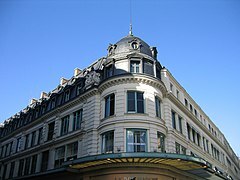 Bon Marche is a wonderful Parisian Department Store that can be slightly intimidating. Each section is set up by Designer, not by the type of clothes. We kept walking and stumbled upon a boutique named “Maje.” A wonderful sales person named Nicole offered to help find a Homecoming Dress. She had so much fun trying on dresses, modeling them for other customers and finally discovering “the One.” Our trip was successful and we found our way back to the apartment. For our final night in Paris, we walked down Rue de Saint Beaux Arts then turned down a side street that was much quieter. We found a wonderful Italian restaurant that carried its own stories. As we sat at our sidewalk table, a young mother stopped by with her two children, a girl about 3 years old and a toddler. As we watched, she went over to one of the waiters and they began an animated conversation. The girl quickly grew tired of being ignored and said loudly, “Papa!” He turned to her and picked her up, he smile lighting up the room. Now it was clear – this was his family! Later, as more people came in, it became apparent that this restaurant was popular for pizza take-out. Our waiter was the delivery man, and whenever someone came to pick up their pizza, he would saunter out with the box on his head. It was very effective to capture the attention of other people, and several stopped to eat here because of his antics. So French! What a marvelous way to end our adventures in Paris – to enjoy a waiter with his family while enjoying a marvelous meal. Tres bon! What I love about Paris is her many faces. She is proud, aloof on the surface, but warm and friendly underneath. Beautiful architecture and graffiti exist side by side. A sense of place and the urgency found in every city compliment each other. 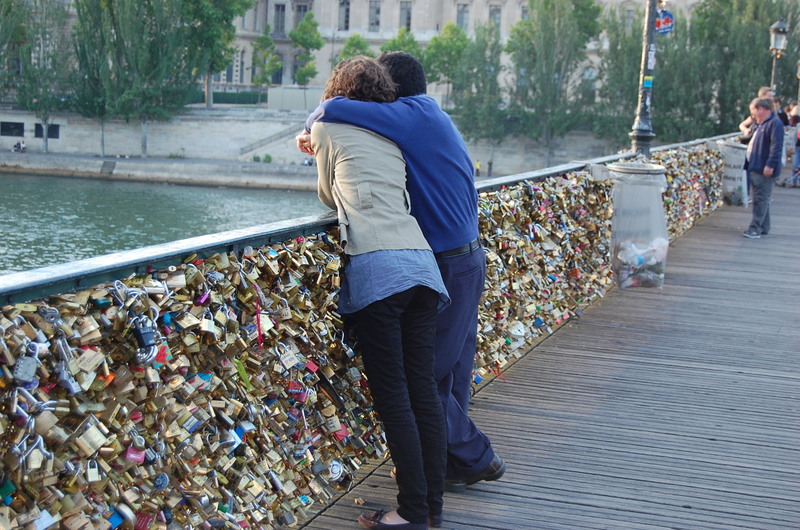 Paris asks to be accepted for who she is…the contradictions and the beauty all join together to form her heart. And the discovery of the various aspects of her soul can take a lifetime of study. I promised to re veal the mysterious gargoyles that I discovered in a corner on top of Notre Dame. Look closely at each of these photos and see if you can’t spot the two statutes that seem ordinary and out-of-place next to their gargoyle cousins. Instead of fanciful, they are lifelike and from the natural world. It rained all night, lightly tapping a dance on the clay tiles and plexiglass skylights. Damp, wet smells of saturated earth and porous stone permeated the cool air of our apartment. Burrowing deeper under the down duvet was the only reasonable option. Finally, it was time to get up. We were in Paris, after all, and there were so many more things to see and do. 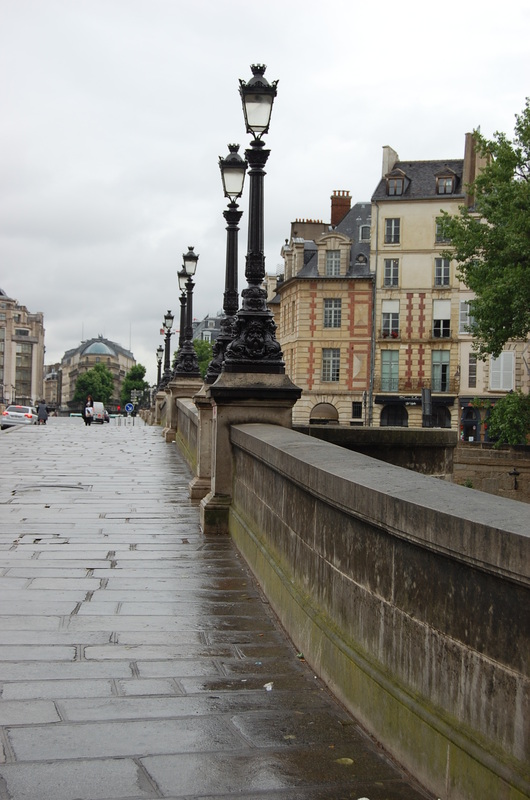 After much groaning and cajoling, we stepped onto the street, armed with one umbrella and a general sense of the direction and distance to reach the Musee D’Orsay. We didn’t count on the fact that the person holding the umbrella tends to keep it more on her side. Nor did we consider the traffic splashing water on the sidewalk. But we were in Paris, so who cared? We reached the Museum and figured out the correct line for holders of the Paris Pass (a one-price for multiple museums pass that is a must for Paris). By the time we got inside and checked our stuff, it was 10:00 and time for something to eat. Instead of starting on the ground floor, we knew there was a cafe on the top or 5th floor. Stairs made it easy to go up, as people poured into the Museum. We found the cafe and something that took my breath away. One of the large clocks that were part of the building in its former life as a train station. I was thrilled to find it so quickly and began taking photos from different angles. When I finally came up for air, we discovered that the cafe was next to the Impressionist Exhibit – the main reason that we came to this museum! Fortune was with us, because we were able to tour the rooms and see our favorite Monet, Renoir and other painters before it got too crowded. After walking all over the museum, our feet were tired. We took the train back to the St. Michael stop and walked the last two blocks to the apartment, rain still coming down. Casement windows open to the inside, which let us hear the rain without having it come inside. The perfect way to spend a lazy afternoon…listening to the rain outside and reading a great book, snuggled under the cover. But the day was not over. We knew that the Louvre stayed open late on Wednesdays until 9:30 p.m., so we waited until about 4:30 to walk over and see our second museum of the day. The Louvre is housed inside what was the Royal Palace. Photos do not show the sheer immense proportions of the buildings, or the amount of acreage is displaced by the grounds. Again, we were able to skip the lines because of our Paris Pass. But decoding the audio guide was next to impossible, so we winged it with our guidebook. We found the Venus de Milo and the Mona Lisa, as well as many other fabulous paintings and sculptures. By the time we walked out of the Pyramid and back into the courtyard, it was 8:30 p.m. but still light. The rain had stopped and left the air washed clean and pure. A walk over the Lock Bridge (Point Neuf) was wonderful, because the sun was below the horizon and dusk had fallen. We have been chasing the sights, sounds and tastes of Paris that we hit a wall. This morning, we slept in and didn’t get going until 10:00 a.m. Sacrilegious to all of the annal-retentive travelers, but necessary for us. We needed a moment to just breathe. I am amazed at how easily we have adapted to the rhythms of Paris. Of course, we are on vacation and not working…but still. Breakfast from the crepe stand, an espresso for me and we are ready for our next adventure. On to Montmarte and Sacre Coeur. Getting there was a bit of a challenge by Metro – three change of trains/subways, but we made it without incident to the Abysses Station. Many narrow streets beckoned, but we stayed the course and found the Place due Tetra where the artists have set up their easels. 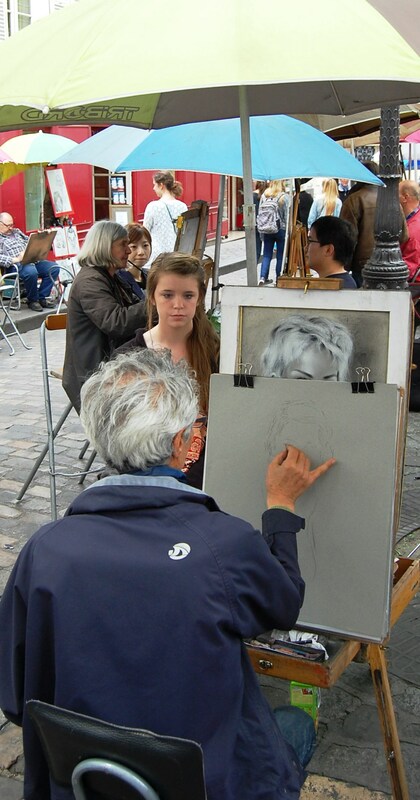 After walking around, we chose the artist to paint her portrait. How amazing to see him swiftly stroke the charcoal, outlining her face and its major features, then going back to add the detail. A crowd stood behind and watched silently admiring his skill. The end result was everything we hoped it would be! Next it was the steps leading up to Sacre Coeur and the great cathedral itself. We enjoyed seeing the wonderful painting of Jesus after the Resurrection, which is painted onto a dome over the altar. But it was the trip up to the Dome that got us excited. It is 300 steps upwards on a small round staircase that seems to go on forever. We walked through a narrow alley to reach the next level an d discovered the skyline of Paris. A strong breeze wrapped around us as we slowly walked around the perimeter of the dome, taking pictures as we went. And then we saw it – the Eiffel Tower in the distance! It was great fun to see who could take the most creative photo of the Eiffel Tower with a gargoyle. The one that made me laugh was her fascination with pigeons…check out the photo I took of her…taking a photo of a pigeon! Retracing our steps down the 300 steps, and on down the hill, we found the Metro station and made our way home. To a relaxing time on the terrace, jazz music playing from the apartment across the way, liquid note floating on the evening air. Yes, it is good to take a moment and just…breathe. We walked out of the Traccadero Station and I knew what to expect right around the corner. I didn’t mention it to my daughter, because I wanted to see her reaction. We turned the corner…and there it was. The Eiffel Tower in all its glory. She stood stunned for several seconds, then started taking pictures like a mad woman. We did find one nice person to take our picture together, but mostly we took selfies and one-zies (I just made that up. Its the picture you take of the person who is with you, then they take your picture in front of the same thing). Walked across the Seine to the Eiffel Tower…and the lines were horrible for the elevator to the top. So we did the next best thing and walked to the second level. (What great training for her trip later in the summer to Mount Rainer!) The views from the second level are inspiring, and much better than from the top (its too high to see any detail). The Seine River boat cruise was fantastic. Slowly moving by all of the famous sights of Paris is breathtaking and humbling all at once. I took too many photos to post here, but let’s just say that it is well worth the time. We had lunch on the steps of the Seine (who knew that ham and butter nestled inside a baguette would taste so good?) and fed the birds. Two small boys started chasing the pigeons and managed to get water all over themselves (but they never caught a bird). Walking back across the river with the Eiffel Tower behind us, licking ice cream and waving to the other boats as they cruised is a favorite memory of this trip. We took the Metro from the Troccedero to the Opera station, because we had to meet our tour guide for the electric bicycle tour in the middle of La Vendome. This is a large plaza built for the nobility in the 18th Century so they could go outside without being mugged. This is also where the Ritz Paris hotel is located, owned by Dodi Fahed’s father (and where they left after dinner before the tragedy in the tunnel). We rode the bicycles all through back streets and to many hidden gems. The highlight for me was riding through the large plaza that is surrounded by the Louvre. We rode past the Pyramid and stopped at the monument that lines up the plaza with the Champs Elysse, the Arc de Truimphe, etc. Again, too many things to list but the feeling of riding a bicycle down narrow, cobblestone streets was exhilarating! 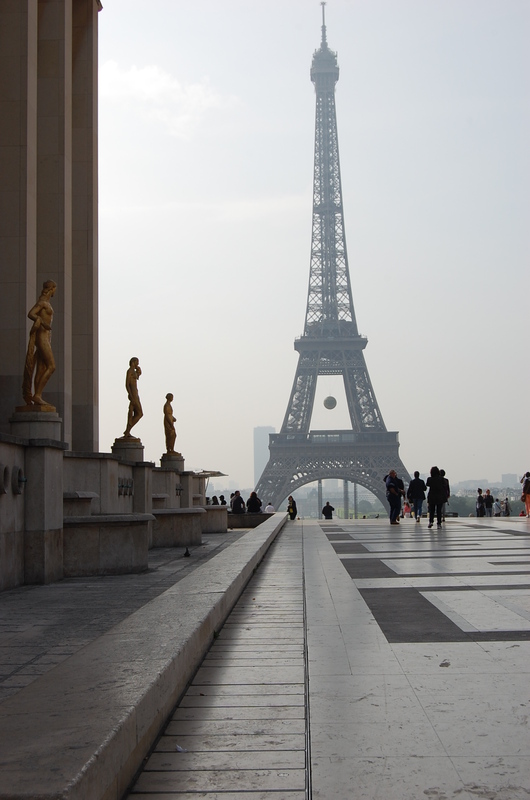 What a great day to spend in Paris – chasing the sights! Flying for more than 9 hours can mess with your head. I felt like we were chasing the sun, because it was always behind us as we traveled east and it was setting in the west. But watch out – we played a game of tag and won! We met the sun as it came around the earth on the back side. Only problem was that our back sides were done (literally and figuratively). 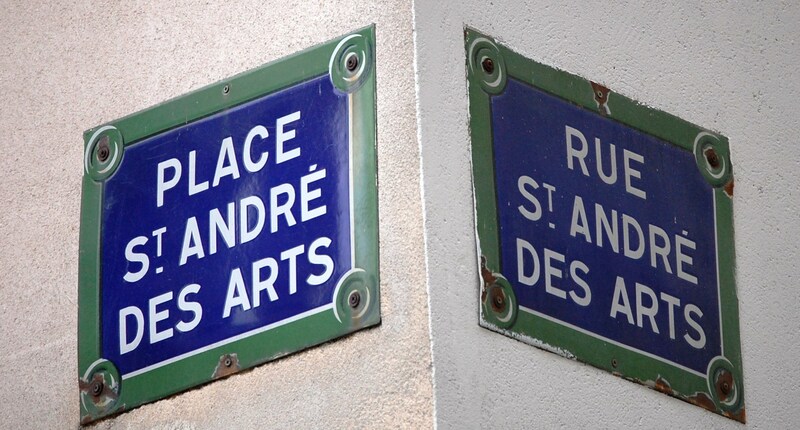 Although we slept on the plane, when we finally arrived at St. Andre des Arts, we were exhausted. We staggered through the day, but I am writing this at 8:00 p.m. and she is already down for the night. As we walked through our neighborhood, we came across a crepe stand that w afted tantalizing smells into the street. And guess what their favorite sauce is – Nutella! The chef let her go behind the counter for the photo. And the crepes were delicious! That’s not to say that we did not take advantage of our location. St.-Germain-des-Pres is an ideal spot to get anywhere in Paris. And the best part is the neighborhoods. We walked down small narrow streets that looked just like that hundreds of years ago. Imagine who else walked down these streets? Notre Dame is a five minute walk from our apartment. 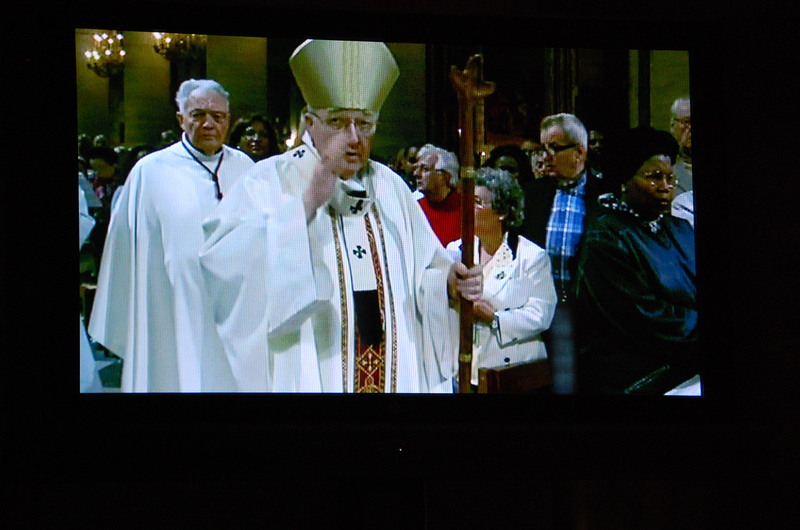 We managed to attend a 6:30 p.m. mass (well, I did; she stayed in the apartment). I couldn’t help taking photos – w ith a setting that fabulous, who could blame me? 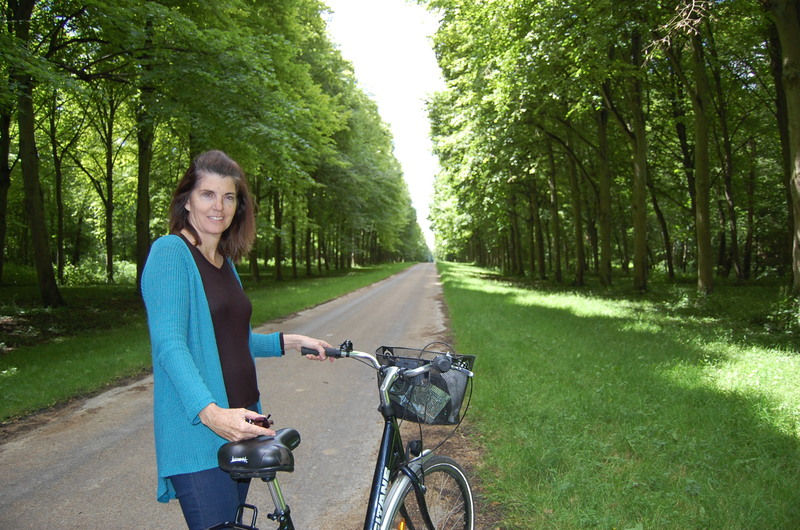 Tomorrow is the Louvre and a bicycle tour of the back streets of Paris. Paris is known as the City of Lights. Hopefully, tomorrow will be a great start to see Paris at her finest. Until then, avoir!